I love my easy chair. It’s comfy. It’s made with microsuede that cleans up with a damp cloth or baby wipe. It’s lovely. Cat hair wipes right off. Stains? Baby wipe or a damp cloth with a bit of diluted dish soap. Lovely. So what’s the problem? It doesn’t breathe in 100F weather. Sitting in the easy chair in shorts for any duration of time and I feel like I’m suffocating. I start to sweat. At least, I don’t stick to it like I would with leather. But it’s still not comfortable in the heat. As the weather climbed into the 90s again this weekend, I looked around for something to put under it. I thought about a cotton towel but eyed a piece of fabric that I wove 18 months ago* for a bag to put into the CNCH 2014 gallery. It never screamed bag to me so I never did anything with it. Yup. It’s fabulous as a seat cover. I was really surprised. The wool and alpaca weft were not itchy in the head at all! Wool really is the original miracle fabric! I will line the fabric so it looks a bit more finished but I have found a winner! I may even decide to put a bit of batting in for use as a meditation cushion. * This was supposed to be part of a guild project/display for CNCH 2014. Each stripe of the fabric consists of yarn spun by a guild member and dyed during one of the guild’s natural dye baths (save one commercially purchased yarn). For the most part, these were indigo dyed. There is a bit of walnut in there too. The orange separating stripes were dyed in madder that we dug out of Phyllis’ yard. Each guild member would bring their own weft. 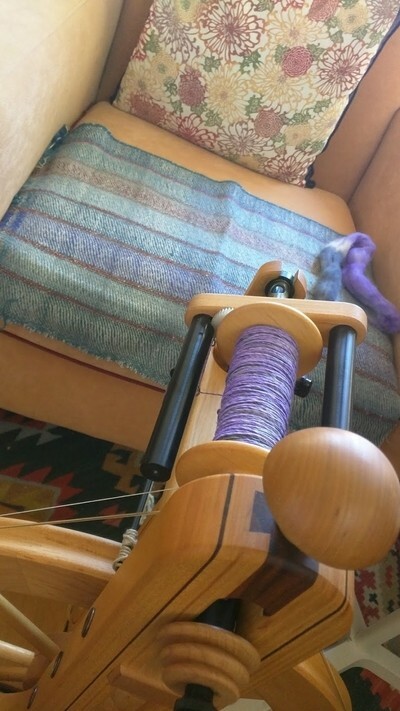 My warp was from some grey alpaca roving I had (dyed with logwood grey, I believe).